Purchase Brian Jarvi Art Prints online from ArtBarbarians.com located in Minnesota. How can you measure the power and grace you find in the wild? Not with words you can't, but some people are able to express that intangible that so many of us find hard to describe. One of those ways to display the power of nature is through Brian Jarvi art prints. Mr. Jarvi not only captures the correct physiology of the animal itself, but also some of the feeling behind it. The fear, the contented look and the power of stalking are caught in these wonderful prints, simply unmatched by anything else we've seen. This artist brings out those feelings of the power of nature in animals from America to Africa and we feature here on our web site. We have a couple of examples of this fine artist's work. You get a sense of perspective and movement in his art and an excellent color representation that is deep and rich, along with a sense of light and shadow. 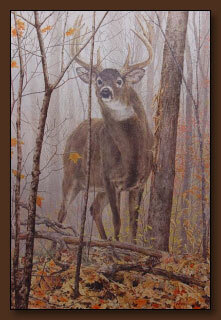 Brian Jarvi art prints have been famous for many people and one of our treasured Minnesota wildlife artists. Brian Jarvi has been drawing and sketching since childhood. He has always been fascinated by wildlife and it was natural to combine his love of the outdoors with his love of art. Jarvi uses firsthand observation to create realistic portrayals of wildlife by combining intricate detail, dramatic lighting, and anatomical accuracy. His popularity is ever growing and he is widely known for his "up close and personal" compositions. Africa, and it's incredible wildlife has been Jarvi's passion for the past decade, now. "The tremendous diversity, the sheer numbers, and often sobering confrontations of the wildlife has spawned more ideas than I can ever hope to put on canvas". Jarvi is the first artist to win both the Minnesota Duck and Pheasant contests in consecutive years and only the second artist in history to win both of Minnesota's major prints contests. Jarvi's concerns for the environment run deep. His artwork has helped raise money for organizations such as the Washington Department of Natural Resources, Pheasants Forever, Minnesota Waterfowl Association, National Wild Turkey Federation, Ducks Unlimited, The American Oceans Campaign, Safari Club International, and Fauna & Flora International. Brian was born and raised in northern Minnesota. Both of these pictures featured here showcase works that have an intense feel to them. 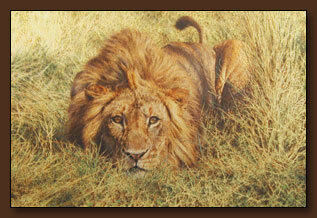 You can almost sense the alert nature of the deer above or the lion ready to pounce or chase down it's prey. It's almost as if the you sense that you might be in some kind of trouble! It's that kind of artistic rendering that makes his art so special and prized by collectors of fine art. You may want to browse our prints and you'll find that our selection of paintings is one of the deepest on the Internet, with many artists listed here. We're adding new paintings and prints everyday, after that you may want to move onto our original paintings area which will give you an idea of the depth of the art we carry. It's exciting to be a part of an offering which brings people such a sense of satisfaction and joy. The colors, the depth, the natural settings, all of this makes this art we care about so special. We have many personal relationships with many of these artists that we exhibit and sell, and they trust us to portray their art in a correct manner. Those relationships give us the advantage of getting you some of the best new art first, so you can add to your collection before what you want is gone. Call us if you have any questions about anything you see on our web site or need to know more about Brian Jarvi art prints. We're happy to answer your questions personally regarding availability or something special you're looking for.